This book has tantalized me since finding it at a B. Dalton bookstore in Oklahoma City, circa 1985 (...maybe?) at the impressionable young age of fourteen. Bruce Galloway's essays vastly improved my D&D game, though any hope of playing his strange and eccentric system was beyond miniscule since the his taste for the obscure, the esoteric and for absolute realism made his game mechanics cause my brain to melt and run out of my eye sockets in puddles around my wringing hands. But I am again thinking of giving it a try, and this is a heads up for my prospective players. I've always wanted to run at least a series of scenarios based on the rules, but I state this with the caveat that it must be the closest facsimile of Galloway's rules that I can possibly manage, since the normal calculations for magic and combats during a round seem, at long study, to require Stephen Hawking as a DM. Oh, yes, I can understand them...can I execute them in a manner expeditious enough for a role playing game session? Without serious truncating, my guess would be no, and so I will use what parts of the rules are expeditious and leave the rest for Mensa members. 1. It is historical. You will be a character in a real world medieval or ancient setting in the real world of earth, albeit magic, religion, and monsters will be real. 2. All player characters will be human. 3. At times during the game you may lose control over the actions of your character. These times are when morale is checked before and during physical combat, when going berserk in battle, and when you are required to roll a temptation savings throw. This is based upon your character attributes, and is used when a DM thinks your character's refusal of a proffered temptation is not in alignment with your these scores. 4. Astrological influences are considered paramount to magic. The proper estimation and application of these ethereal influences are integral to your crafting of spells and the outcome of the same. Although a sample spell list is given, you and the DM are required to craft spells as you conceive of them, calculating an array of influences and arriving at a "Degree of Difficulty" which determines your percentage chance of casting. Three rolls are needed--one to establish a "link" with the ethereal plane, one to determine whether a target saves against your spell, and one for the actual casting. Mana points are expended to cast magic spells--these are gathered through rituals and preparations as well as by gaining magical levels. 5. Religion works along the same lines as magic but success is determined by a point system which awards or penalizes a priest or cleric for their daily actions depending on keeping with the Deity's established codes of conduct. Prayer, fasting and penance increase scores as well. 6. You gain a new level of Experience with every 1000 adventuring points. Points are gained through using character skills. Upon attaining a new level you will receive 2 points to spread among your physical and mental attributes as desired. 7. There are only four basic types of characters: clerics, mages, fighters and thieves. So, these are the features of the game--quite different form D&D as any experienced player can see. Why play, you ask? 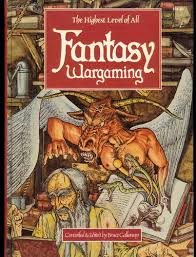 If D&D is a good meal you enjoy regularly, look upon Fantasy Wargaming as an exotic cuisine to enjoy occasionally and with great appreciation.